Thinking back to Super Mario Odyssey’s performance on the Nintendo stage at this year’s E3, it was always going to be an incredible, theatrical masterpiece. When its trailer opened with a rampaging tyrannosaurus rex before shifting into the relentlessly upbeat strains of Jump Up, Super Star and a montage of spectacular, colourful worlds, I was hooked. October seemed miles away at the time, and as other spectacular releases made their way onto the Switch months later, the Mario-fever started to cool. The consensus seemed to be that the game would be great, but as the weeks leading up to it threw out hits like Fire Emblem Warriors and announcements of other blockbusters (Wolfenstein and Skyrim come to mind here), it was easy for Super Mario Odyssey to fall off one’s radar. Now that I’ve played the game, I can wholeheartedly say that the wait was worth it, and that if I had any doubts about Nintendo’s ability to guide this franchise in the right direction, they’ve been summarily eradicated. Related reading: Mario Kart 8 is another obvious choice for Nintendo fans on Nintendo Switch. Matt's full review. Super Mario Odyssey is many things, but at its heart, it is both an homage to the Mario titles of yesteryear and an entirely new beast. That duality of relying on tried and true sensibilities from games like Super Mario Sunshine and outliers from the Nintendo stable like The Legend of Zelda: A Link Between Worlds brought an incredible amount of flavour and pizzaz to the proceedings, and I’m not only saying this because there’s a food-themed kingdom in the game. Underpinning its design choices is a clear sense of theatricality and showmanship – it reads and presents almost like a play in multiple parts and Mario makes for a charming leading man, “yahoo”s and all. ‘All the world’s a stage, and its heroes merely plumbers,’ could have been Super Mario Odyssey’s calling card, and not a hair would have seemed out of place. The spirit of performance and theatre permeates every level, from the carefully-composed music to the applause you receive when you perform an impressive coin-collecting feat, and it all adds yet another dimension to the experience. 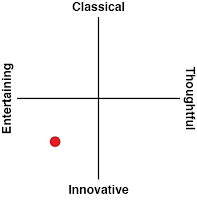 The dramatic arc of traditional plays is easily summed up as having five distinct parts – the exposition, rising action, the climax, the falling action, and the denouement. Super Mario Odyssey milks the dramatic arc as its primary means of structuring the narrative, which means that it clearly signposts your motivations and keeps the story moving where possible, ensuring that you don’t get so bogged down in collect-a-thons that you forget about what it is you’re meant to be doing. That’s by no means a slight against collecting shiny things; they’re the crux of every bloody Mario game, but it’s refreshing to feel like you have a real purpose and that people are actually counting on you. When contrasted with the thankless residents of Super Mario Sunshine’s main world and how franchise games that weren’t part of the Paper Mario series had taken a generally light approach to plot, Super Mario Odyssey really proves that you can have your completionist cake and eat it too while enjoying a solid narrative. It all gets off to a cracking start when you load up the game for the very first time and the first thing that you experience is Bowser’s fist in your face. Mario is very unceremoniously kicked off an airship tens of thousands of feet in the air, and his signature hat is crushed underfoot before being shredded into a million pieces. As luck would have it, his hat is saved by a magical sentient counterpart who wants revenge on Bowser for kidnapping a beloved family member. Left without much choice, the two team up in order to protect the ones that they love. This provides additional backstory and context to what typically motivates Mario – wanting to save Princess Peach. We all know that one of the highlights of the game is the player’s new ability to possess the body of any animal or object (within reason), and it’s nice to see that the reason for that is fleshed out and that Mario hasn’t just commandeered a mindless accessory for the job. The game’s tutorial was another contributing factor to Super Mario Odyssey’s stellar start. It was far less intrusive than I had initially expected, and the quirky feel of the first kingdom and its inhabitants encouraged me to explore and to experiment with various abilities more than the usual arbitrary obstacle course that you’re fed in other RPGs. Flower buds poking out of the ground in an otherwise dreary landscape prompted me to throw Mario’s cap at them, and the tops of wooden fence posts that looked suspiciously hat-sized all served as subtle visual indicators of ways that Mario could use his newfound skills without having to bludgeon players over the head with an abundance of immersion-breaking instructions. The few times that I had to watch a short looping video of an action were all optionally triggered and useful since they were to do specifically with Joy Con motions, and it was nice having hints scattered throughout the world in the form of signboards if I did feel like I needed a helping hand. Everything evolved organically from the word “Go,” and the layout of this first kingdom meant that concepts intrinsic to the game were unraveled over time in order of difficulty and complexity, which set the tone for the rest of the next part of the game – the rising action. The rising action really is the majority of Super Mario Odyssey’s 16-hour main story runtime, and it’s composed of exploring a myriad of different kingdoms, all with unique concerns and characters as you hunt down traces of Bowser and Princess Peach. This formula is well-known to the Mario games, and it has been ever since their conception. Nintendo were smart to not fix what ain’t broke and instead of introducing new gimmicks, Super Mario Odyssey is the ultimate refinement of the franchise’s “collect the shinies, save the girl” formula. 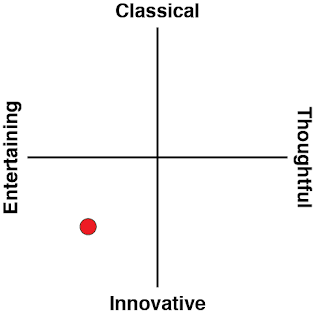 The systematic, smart design of the first kingdom and its concepts is applied to the rest of the game when it comes to Mario’s adventures, in the sense that the difficulty curve means that concepts and interactions are organically introduced to you in a way that makes everything seem just challenging enough without being frustrating. You really feel like you’re accomplishing something when you pull of a quick capture or solve a puzzle in Super Mario Odyssey, and instead of the “do whatever you want” approach that was the defining feature of The Legend of Zelda: Breath of the Wild, it’s nice to see so much thought put into an enjoyable, linear experience. It’s worth mentioning that there was some uproar about Super Mario Odyssey not having a Game Over mechanic, and that questions about ramifications for the game’s possible difficulty were floating around. Was the lack of a Game Over mechanic hinting at the fact that it’d be an easier title than usual? Why the use of easily collectible currency when it comes to managing the traditional life system? After experiencing it first hand and recalling the words of Yoshiaki Koizumi, who mentioned that Game Over screens would ruin player immersion with the various kingdoms, it’s safe to say that Nintendo have been right on the money with how the health system works in Super Mario Odyssey. As with other titles, there are checkpoints littered throughout the game to make sure that dying isn’t an onerous task. Furthermore, in some particularly treacherous parts of the game where I scraped through by the skin of my teeth, a Game Over screen would definitely have added frustration where there was no need for it. Even when Mario plunged to his death multiple times in various twitch platforming sections that I forced myself to play, each demise was a motivator. I’d see the coin counter tick down and realise that with each careless jump, I was one step further away from purchasing my dream costume so I’d try even harder the next time. There’s nothing more infuriating than playing for hours and getting so close to the end of a level that you can taste it before hitting a Game Over screen, and people have stopped playing games for less. The rework of the health and life system keeps the traditional damage indicators that players already know and love; it just replaces the punitive finality of a “you failed” graphic with punishment on a less discouraging scale. It’s not as huge a change as people were speculating it might be, but I can see how it could make the game significantly more enjoyable for some and that’s never something to be mad about. There’s plenty to love outside of the exploration, even if that is the main point of every Super Mario game ever. 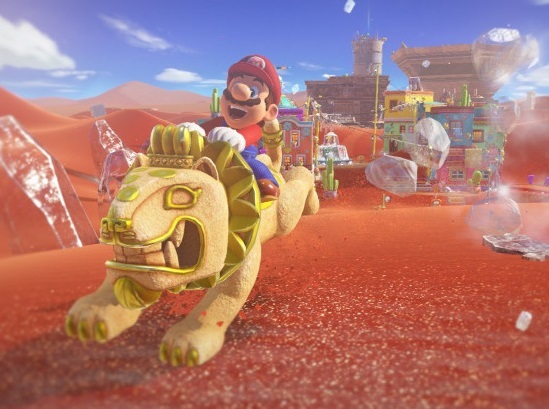 What really stood out as charming in Super Mario Odyssey was the attention to detail which in turn gave the narrative some much-needed momentum. 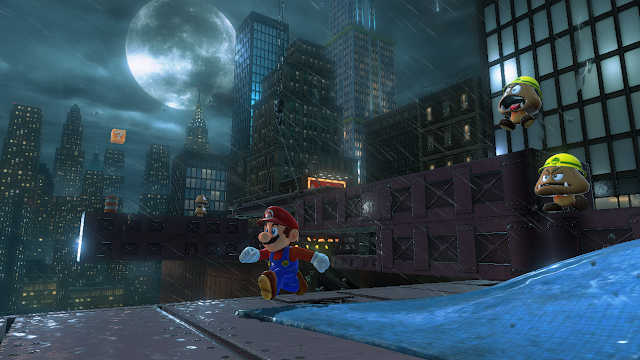 I constantly felt like I was being driven to greater heights during the course of my adventuring, and all of that came to a head in New Donk City, just as platforming fatigue was starting to set in. The worlds in the game aren’t small by any means, and while it’s not an open-world affair, the sheer size of some of the places you have to conquer can be both spectacular and overwhelming. Without giving too much away, there was an excellent segment where Jump Up, Super Star played in the background and it’s clear that the level was hand-crafted to match the ebb and flow of the music. You even have 2D segments reminiscent of Super Mario Brothers, complete with 8-bit atmospheric touches, and cheeky nods to reimagined enemies from titles like Super Mario Galaxy that lend expected nostalgia without wearing out their welcome. 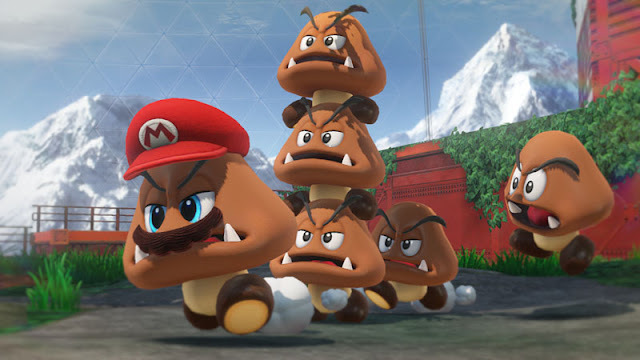 That’s just a few examples of the many satisfying moments dotting Super Mario Odyssey that gave me the spring in my step that I didn’t even know I needed; the various kingdoms all have their own beautiful additions that work to open your eyes to the bigger picture after hours of Goomba-stomping. Yes, you can be obsessed with jumping and hoarding coins but at the gentle prompting of the game, it’s nice to take a step back and appreciate the finer things in life. The NPCs really come into their own, with the inhabitants of each world having their own eccentricities, preferences, and preferred means of gambling. You meet pepperoncinis who are expert chefs, lion-riding skeletons inhabiting a freezing desert, and fashion-forward mermaids: all of them have had something precious stolen by Bowser, but their optimism and “She’ll be right” attitude are a great antithesis to any frustration that you may encounter. Boss fights have that same thread running through them; with a mix between standard franchise encounters and the use of your trusty cap to manipulate everything from fishes to battle tanks, they fit seamlessly into the theme of their respective kingdoms and it’s a delight to take them on instead of an obligation. 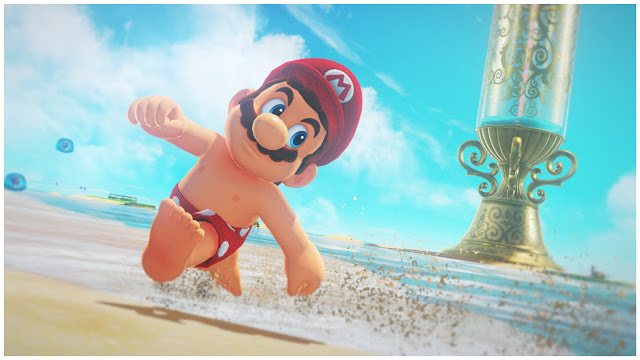 You’re also rewarded for immersing yourself in local culture by wearing the appropriate clothing, which unlocks its own rewards and mini activities for you to enjoy even when Bowser’s uncanny ability to be one step ahead of you threatens to ruin the fun. Every secret interaction and boss fight drives you closer and closer to the climax of the game without feeling predictable, and it’s the way that Super Mario Odyssey packages exploration with narrative cues that really speaks to some fantastic pacing. When the twist hits you, it’s unexpected, unless you’ve gone ahead and watched the ending of the game and spoiled yourself. 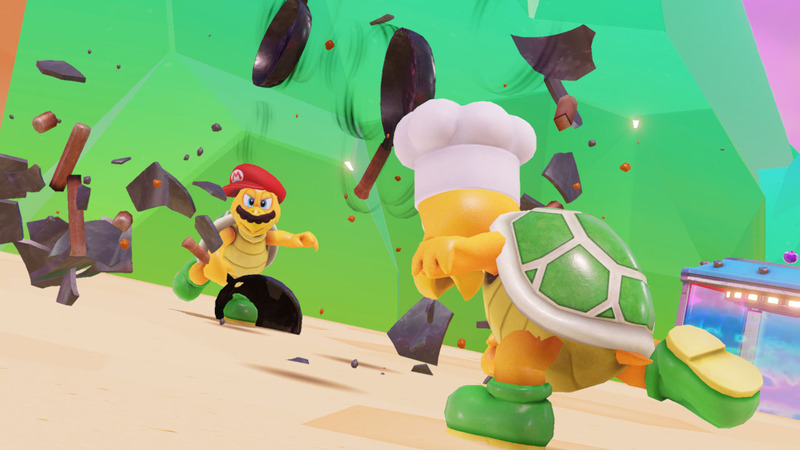 However, the resolution of the narrative’s main conflict isn’t necessarily the end of Super Mario Odyssey – the game takes just as much delight in establishing the falling action as it did with getting you to thwart Bowser’s nefarious plan. Once you’ve done your job and found Princess Peach for good, you’d usually get to hang up your boots and call it a day. However, by the end of all that, I wasn’t ready to let things lie. Luckily, Nintendo anticipated that the title would leave fans wanting more, and they were kind enough to give us a dearth of bonus content to keep ourselves occupied. You get to visit every world at your leisure now, with twice as many shiny objects to find and secret pathways to explore. More optional segments open up, and if you thought that there were a ton of platforming challenges before, things only get more heated and intense. Your main motivation to keep going is the fact that you can travel to a whole new world that didn’t feature in the campaign, but even when the game decides to put you in the driver’s seat and lets you decide what you want to do, its earlier guidance means that you’ll never feel like you’ve seen it all. Sure, you’re not being propelled forward by narrative events any more, but the way that the game teaches you to look for the unexpected and to find the magic in the ordinary in each kingdom means that you’ll be independently looking for adventure. Finding hidden objects and quests becomes even more rewarding because you aren’t being explicitly told to do any of it; it all comes down to the player’s keen eye or quick reflexes whenever a new discovery is made, and it feels so good. Related reading: Another must-play Switch game starring Mario is Mario + Rabbids. Matt's full review. I’d usually count myself a completionist who’s only goal is to earn every single achievement possible, but Super Mario Odyssey showed me that there’s so much more to it than collecting things. Maybe I’ll revisit the wonder of the Cascade Kingdom and ride a tyrannosaurus rex. I could even play fetch with a shiba inu amongst the sand dunes, or bust out Mario’s infamous swimsuit and test my skills against an ornery octopus thirsty for revenge. The best part of getting to the game’s ending is the fact that it’s a journey of your own creation, and if you reflect on the game as a whole, it’s really a linear quest that somehow feels more freeing than the largest open-world game.